My passion for the human voice developed over time in a gradual progression from modern orchestral work to music of an earlier era. The violin is my primary instrument, and my early training in the 1960s was the repertoire of the nineteenth century. Later, when I began working on music from an earlier period, Bach’s Sonatas and Partitas for Solo Violin, I was immediately drawn to the human-voice ranges (soprano and alto) that Bach primarily used. This range does not extend much beyond first position, and its timbre is what I consider the most beautiful on the instrument. I therefore felt that the Sonatas and Partitas fit the nature of the violin in a way that some of the nineteenth-century repertoire could not. This, for me, was a new way of hearing, using, and playing the violin. The expanded “fitness” of how to use the violin broadened into my life-long composing style when I began working, more than three decades ago, with musicians trained in early music techniques. The quality of sound produced by these techniques synched exactly with my ideas of beauty: pureness of tone, focus, and the delivery of sensuous lines requiring intensity and concentration. All of these combined to produce what I hear as a sublime discipline of elegance, epitomizing the balance of restraint and passion. From prizing both instrumental and vocal music, I gradually I began to believe that the human voice stood apart from all, and this belief has persisted. I believe that a singer can, with astonishing ability, express the human condition and become a “universal voice,” and as a result, my work since 1989 has been almost exclusively vocal. My instrumental accompaniments for vocal pieces are most frequently used to highlight and contrast the colors and qualities of the voices and to lay foundations that help to emphasize the vocal beauty. The awards and grants I have received have especially focused on my choral music, including the 2011 Daniel Pinkham Award from Coro Allegro (David Hodgkins, Artistic Director), and Europe’s prestigious 2005 Echo Klassik Prize, awarded to the ensemble Tapestry (Laurie Monahan, Director) for their recording Sapphire Nightwith music by Hildegard von Bingen and my nine-movement work, The Nine Orders of the Angels, about which Gary Higginson of Music Web UK wrote, “I found myself thinking, that Van Ness’s â€˜The Nine orders of the Angels’ is what Hildegard might have written had she have been alive today. But there is no pastiche involved here.”Chamber Music America awarded its “Album of the Year” to Tapestry’s The Fourth River, containing two of my works. The King’s Singers have included one of my pieces on two of their CDs: The Best of the King’s Singersand From the Heart. Because I prize the human voice so highly, I am especially fortunate when singers, and those involved in the vocal craft, speak well of my music; for example, Christopher Gabbitas of The King’s Singers says: “The beauty of Patricia’s music is in the atmosphere it creates; wherever we perform it around the world it is universally well-received—and as with all good music it breaks down the barriers of language and culture, communicating on a higher level.”2 Given my love of the singer’s craft and passionate desire to use the voice as an instrument of expression, Music for the Psalms provides me with a perfect opportunity. The second element underlying my choice to write Music for the Psalms involves several basic needs that this project can meet. 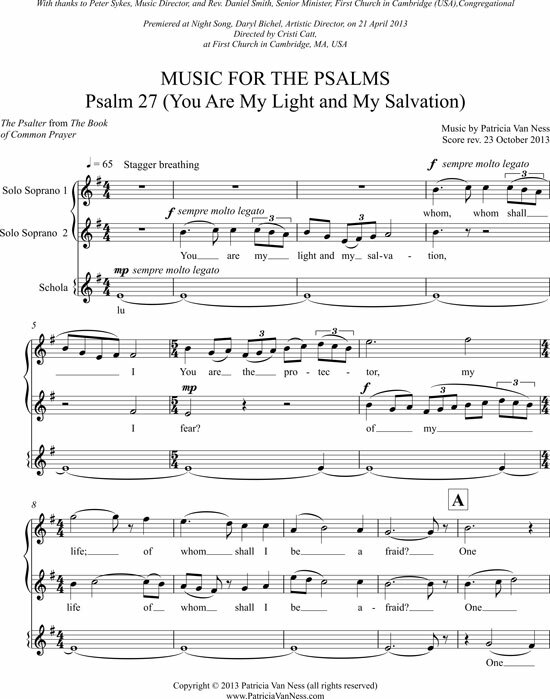 I have been Staff Composer at First Church in Cambridge, Congregational in Massachusetts since 1996, and excellent musicians are available to perform many of these new Psalm settings. I work closely with my colleagues: Music Director Peter Sykes and the First Church Choir. Another opportunity arose several years ago when Peter suggested I begin composing for First Church’s new Sunday evening Compline Service, Night Song. This all-music service, overseen by Artistic Director Daryl Bichel, contains five separate ensembles: a women’s (Cristi Catt, Director), a men’s (James Busby, Director), and a mixed octet, a mixed trio, and a mixed quartet, these last three directed by Daryl Bichel. The ensembles rotate, each performing the service approximately once monthly. Peter Sykes’s suggestion to begin regular work with Night Song’s excellent musicians was exciting and inspiring, and one of the reasons I decided to take on Music for the Psalms. Another need met by the project is the scope of the work. Music for the Psalms will take me many years to complete, but this for me is part of its attraction. I live in a quiet place, compose five days a week, and prefer composing large pieces that leave me the focus to work alone. The fact that Music for the Psalms involves so many movements and will take so many years fits well into my favorite compositional style of incremental and solitary work. I’ve completed about twenty of the anthems so far, and ten are currently in progress. I am writing the pieces in no particular order, although my initial thought was to write them according to St. Benedict’s Rule as they were used in the monastery. I discarded this plan fairly early on for several reasons, most particularly because I didn’t want the project to appear exclusively Christian. The third element underlying my choice to compose Music for the Psalms is the opportunity to use my favorite composing tools, which I have adopted from medieval and Renaissance church music. As a composer, my goal is to write music that is moving to me and that conforms to my definition of beauty, a word that is frequently mentioned in this article. The beauty that moves me the most, and has inspired and influenced my own compositions, is expressed most vividly in the music from the medieval and Renaissance eras—music that is imbued with passion as well as restraint. Why these musical eras move me so deeply can best be described by the tools I have taken from them, and the most important of these is chant. Chant: I believe the seeds of my love for medieval devices in music come from my training as a violinist, in part, because the violin is linear, as is chant. Chant resonated when I first heard it, reminding me of a smooth, legato, seamless bowed phrase. Medieval chant, for me, is one of the most beautiful of musical genres. Spare, linear, and graceful for the singer, these sung prayers convey a range of human experience: joy, sorrow, relief, longing, grief. These myriad emotions are expressed by a single melody sung with focus and concentration; the result is an exquisitely simple and elegant whole that epitomizes my definition of beauty: the passion of the prayer is restrained by the unison, focused line. Latin: I have used the Latin language many times, both in my texts and in some of the new anthems, for several reasons. 1) Latin in the modern era has the quality of a found-art object, and it is exciting to put it to new use; 2) Latin honors the medieval and Renaissance church tradition; 3) Latin’s beautiful vowels fit many of the contemplative texts and the chant-like music I have composed; 4) Latin shrouds the immediacy of the text; it becomes a veil between the sung word and the listener’s ear, adding mystery and remove, and the listener’s imagination is engaged; 5) Latin gives overtones of meaning to the translated text, reminiscent of a cathedral’s overtones of sound; and 6) Latin balances the passion of the texts with restraint. More practically, Latin is used if requested by the commissioning party. Modal scales: The use of modal scales presents a special challenge: how can I compose modal music that sounds genuine—unselfconscious—to my ears? This is difficult for me (and produces a lot of music that never sees the light of day). In addition, I frequently use modal scales as a tool to expand my harmonic and melodic palates. Interval of the fifth: The violin is tuned in fifths, an interval that I find beautiful and pure. When I began to listen to medieval music, I was immediately attracted to the open fifths in organum and other early music. I love this interval, and most of my pieces center around it. Non-metered writing: In medieval music the text often propels the music rhythmically. This results in non-metered writing. I often use text-driven melodic writing to help me compose more freely. Chant prism: Medieval chant has inspired a technique that I frequently use and call chant prism. This highlights the monody by stacking the chant in chromatic harmonies and/or “flourishing” the chant with an abbreviated call-and-response of the highest few notes of the line. In both of these, I like the exuberant emphasis of the focused line. Example 2, “Psalm 27 (You are my light and my salvation),” uses this tool. 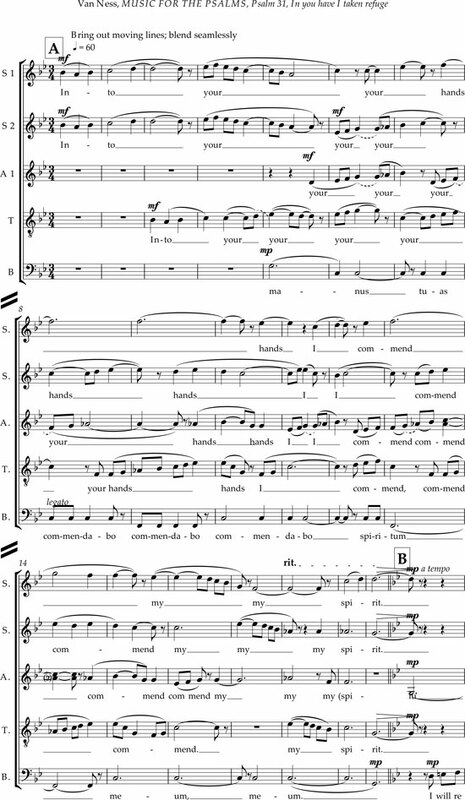 Chant-based polyphony: Chant-based polyphony is another favorite tool in which augmented scraps of chant, especially in the bass line, serve as the foundation of the piece and often provide me with new polyphonic ideas. I was first inspired to use this technique after hearing the British composer John Sheppard’s intense and beautiful setting of “Libera nos, salva nos (I)” (ca. 1640s). Probably the most personal element contributing to my embarking on the Psalms project is my desire to compose sacred music, and this stems from my deeper desire to continue on-going exploration into my concepts of the divine. This exploration began in earnest twenty-five years ago when I was diagnosed with a potentially fatal disease. I found that my notions of the divine were unhelpful, and I began to consider new ideas of a divinity through writing poetry; this expanded almost immediately to setting the poems to new music. The compositions became prayers that used the modal scales, chant, and chant-based polyphony as the tools of expression. I have repeated this process continually since then. These on-going musical and textual explorations have resulted in beliefs that, as in some medieval doctrines, combine the divine and beauty. I now believe that beautiful things, and more specifically, our capacity and ability to experience things as beautiful, are an indication of a mysterious and transforming love from an inner and outer force, and a gift from that force. Even more, I believe that the divine and beauty are essentially one; that is, beauty is a manifestation of the divine—a direct link. Beauty has ultimately been my conduit to this all-loving, non-judgmental divine, and for me, beauty, love, music, and the divine are inextricably entwined. The final element underlying my decision to embark on Music for the Psalms continues from my desire to write sacred music: the opportunity to come to terms with what I often feel is the difficult language of the Bible. I had always found the language of the Psalmsto be off-putting and aggressive. As mentioned above, the principal reason I write sacred music is to continue an ongoing exploration into my concepts of the nature of the divine, and my emerging all-loving and non-judgmental divinity seemed in opposition to the curses and violence and God of revenge in the Psalms. For about a year I hesitated to make a full commitment to the project as I struggled with this problem; then a friend told me about a conference given by the author Kathleen Norris. The conference (2013) was entitled “Too Close For Comfort? Living With the Psalms and Ourselves,” and through Norris I learned many illuminating theological ideas. For instance, the Psalms are not about the divine, but about human notions of the divine; and, according to the Psalms’ poets, vengeance is God’s, not ours. Therefore, the Psalms are a safe forum in which to express every possible negative emotion without actually committing violence, all within the context of a prayer. Most importantly, I learned that the Psalms may be understood in both a historic and modern context. Norris argues that, in the modern context, it is essential that I, as a twenty-first century American, ask, “Who exactly is the enemy in these Psalms?” For example, she says, if I interpret the enemy as internal rather than external, the enemy described might become those things within me that cause me to fret, to lose patience with myself. Therefore, I could interpret Psalm 137’s terrible words, “Happy shall he be who takes your little ones, and dashes them against the rock,” not as an actual enemy’s child being horribly slaughtered, but my own self-destructive thoughts that, if I choose to quell in their infancy, to dash against the rock as soon as they appear, then those little thoughts will not grow up to become strong, and I will be able to thrive and be happy. This fascinating way of interpreting these prayers has reinvented the Psalms for me, and I am grateful to Kathleen Norris and the project for this beautiful gift. Finally, a last thought. Why do I compose as I do, rather than in another style and with different influences? My choice is probably obvious by now; it is based on desire, because, in a continually expanding and ongoing exploration, I seek to create what I think of as moving and beautiful, and in so doing attempt to incorporate in my life those elements of beauty that I identified earlier: simplicity, elegance, and the wonderful tension that can occur with the balance of passion and restraint. 1 For a review of two choral works performed by Coro Allegro, see: Fiona Fraser, “Patricia Van Ness: In Paradisum,” Journal of the IAWM 20.2 (2014): 43-44.